What is a kWh or Kilowatt-hour? Electrical energy is the average amount of power used over a given time period and is commonly measured in "kilowatt-hours." 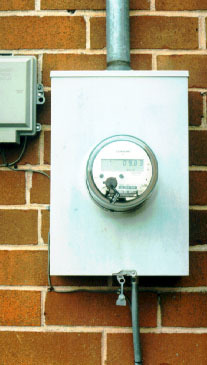 Electric utility electric meters accurately measure the kilowatt-hour energy use by the customer, and may also measure peak power use during a specified time interval. Let's calculate the energy use for a blow dryer. Say the blow dryer is rated at 1,500 watts by the manufacturer. This is how much electric power it uses when it operates. If the blow dryer is operated for a total of 2 hours each month, the blow dryer consumes 1,500 watts x 2 hours = 3000 watt-hours. Since utility rates are based on kilowatt-hours, divide by 1,000 to get 3 kilowatt-hours. This shows how power consumption and operating time are important in determining energy use.